All of our drywall products feature air over hydraulics with controls for turning pumps on and off without electrical wires. Our Hydraulic material piston pump can pump long distances. 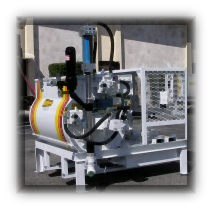 We offer 60, 90, 150, 300 and 500 gallon tanks. Single tank and one pump or split tank with two pumps. Single pumps spray one type of texture at a time. Split tanks can spray two different textures at one time. The 500 gallon offers high volume spraying. D = Desco Mfg., Inc.